Now that kids are heading back to school, it's time to think about how you're going to provide your children with nutritious meals when they're on the go. While you can't control what your kids eat when you're not there, you can set them on the right track to make healthy choices on their own. First, remember you are responsible for what food is available to your children when they are at home. So make sure you have plenty of healthy foods that are easily accessible to kids (and adults) like already cut fruits and vegetables, and easy to grab yogurt, applesauce, nuts, and seeds. The more children see their family eating healthy foods, the more likely they will be to eat them when they're on their own. Of course, just because they love veggies at home doesn't mean they'll choose carrots over cookies at school or a friend's house. Don't stress about it, but do continue to provide nutritious foods at home and teach your children how to incorporate cookies into a balanced diet; that is, teach kids the difference between snacks and treats. 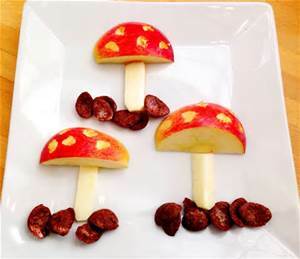 A healthy snack of apple slices, string cheese, and dried cherries or almonds. Snacks and treats are both important parts of a balanced diet, but they serve two very different purposes. A snack is a nutritious food eaten between meals to stave off hunger and provide energy or other nutrients we need to function at our best. Treats are foods eaten in moderation, not necessarily due to hunger. Treats often contain a lot of added sugar, fat, salt, or other ingredients that should be limited in the diet. For example: apples are a snack, apple pie is a treat. Let kids build their own apple sandwiches with nut butter, dried fruit, granola, or other cereal inside! At school, provide kids with nutrient dense snacks that give sustained energy and focus such as fruits, nuts, yogurt, and vegetables (think ants on a log, yogurt and berries, trail mix). Don't be afraid to communicate the difference to your kids when they ask why they can't take a cupcake for snack time at school. Explain that cupcakes are treats and they can eat the cupcake another time, but that at school they'll need a more nutritious snack to learn and grow. It might not stop the whining at first, but over time this will teach your children to reach for nutritious foods when they're hungry, and reserve treats for special occasions. Don't forget that snacks can be delicious and fun too! For many kids, lunch time at school is about everything except eating. By the time your kids get home from school, they might be able to recall every detail of how a friend shot milk out his nose, but they probably won't be able to tell you what, if anything, they ate for lunch. Even if kids come home with an empty lunch box, there's no way to know what was actually eaten versus given away or thrown away. Solve this problem by making a house rule that food doesn't get thrown away at school. Kids don't need to eat everything that's packed, but they shouldn't throw it away. That way you can see what hasn't been eaten and you can adjust packed lunches accordingly or address underlying issues. For example, if your child isn't eating his fruit because he's getting free pudding from a friend, you might want to pack him his own pudding and serve fruit as an after school snack instead. If a whole sandwich comes home every day, you'll know it's time to switch to a different meal. Let your kids be honest about what they're eating at school so you know how to balance the rest of their meals. Going back to school is an exciting time for both kids and parents. Help your children make the most out of the school year by choosing foods that will help him learn and keep him focused. There are lots of online resources to give you inspiration. My favorites include: Meal Makeover Moms (mealmakeovermoms.com), Kids Eat Right (eatright.org/...), and ChopChop Magazine, (chopchopmag.org). Best wishes to students and families for a healthy and happy school year!